Gunpowder was first invented in China no later than about A.D. 850. For hundreds of years, it was used mainly to create fireworks. The Chinese did not use gunpowder as a weapon of war; it was the Europeans who first adapted explosives for use in weapons. By the fourteenth century, Europeans were widely using the explosive as a military device to project stones, spearlike projectiles, and metal balls from cannons and guns. Chemical explosive: A compound or mixture that releases chemical energy violently and rapidly, creating heat and a shock wave generated by a release of gases. Dynamite: An explosive made by soaking an inert (inactive or stable), absorbent substance with a mixture of (1) nitroglycerin or ammonium nitrate, (2) a combustible substance (a substance with the ability to burn), such as wood pulp, and (3) an antacid. Gunpowder: An explosive mixture of charcoal, potassium nitrate, and sulfur often used to propel bullets from guns and shells from cannons. Nitroglycerine: An explosive liquid used to make dynamite. Also used as a medicine to dilate blood vessels. Nuclear explosive: A device that obtains its explosive force from the release of nuclear energy. For the next 500 years, gunpowder was used almost exclusively for pyrotechnic (fireworks) displays and in warfare. Then, in 1856, Italian chemist Ascanio Sobrero (1812–1888) invented the first modern explosive, nitroglycerin. Sobrero's discovery was, unfortunately for many early users, too unstable to be used safely. Nitroglycerin readily explodes if bumped or shocked. In 1859, Swedish inventor Alfred Nobel (1833–1896) began to look for a way to package nitroglycerin safely. His solution was to mix nitroglycerin with an inert (inactive) absorbent material called kieselguhr. He called his invention dynamite. Virtually overnight, Nobel's invention revolutionized the mining industry. Dynamite was five times as powerful as gunpowder, relatively easy to produce, and reasonably safe to use. For the first time in history, explosives began to be used for a productive purpose: the tearing apart of land in order to gain access to valuable minerals. Nobel became extremely wealthy as a result of his discovery. But he is said to have been worried about the terrible potential for destruction that his invention had made possible. When he died, he directed that his fortune be used to create the Nobel Foundation, the purpose of which was to bring about lasting peace and advance technology. The Nobel Prizes in various fields of science are now the highest honors that scientists can earn. Explosives can be classified into one of four large categories: primary, low, high, and nuclear explosives. Primary explosives. Primary explosives are generally used to set off other explosives. They are very sensitive to shock, heat, and electricity and, therefore, must be handled with great care. Two common examples are mercury fulminate and lead azide. Primary explosives also are known as initiating explosives, blasting caps, detonators, or primers. Low explosives. Low explosives are characterized by the fact that they burn only at their surface. For example, when a cylinder of black gunpowder is ignited, it begins burning at one end of the cylinder and then continues to the other end. This process takes place very rapidly, however, and is complete in just a few thousandths of a second. This property of slowed combustion is preferred in guns and artillery because too rapid an explosion could cause the weapon itself to blow up. A slower explosive has the effects of building up pressure to force a bullet or shell smoothly out of the weapon. Fireworks also are low explosives. High explosives. High explosives are much more powerful than primary explosives. 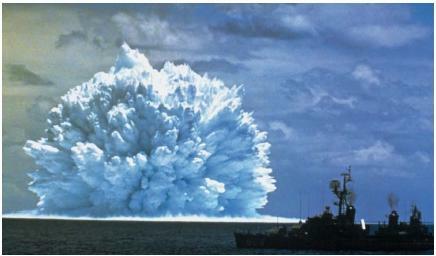 When they are detonated, all parts of the explosive blow up within a few millionths of a second. Some also are less likely than primary explosives to explode by accident. Examples of high explosives include ANFO (ammonium nitrate-fuel oil mixture), dynamite, nitroglycerin, PETN (pentaerythritol tetranitrate), picric acid, and TNT (trinitrotoluene). They provide the explosive force delivered by hand grenades, bombs, and artillery shells. High explosives that are set off by heat are called primary explosives. High explosives that can be set off only by a detonator are called secondary explosives. When mixed with oil or wax, high explosives become like clay. These plastic explosives can be molded into various shapes to hide them or to direct explosions. In the 1970s and 1980s, plastic explosives became a favorite weapon of terrorists (people who use violence in order to force a government into granting their demands). Plastic explosives can even be pressed flat to fit into an ordinary mailing envelope for use as a "letter bomb." with the release of huge amounts of energy. In a second type of nuclear reaction, small atomic nuclei are combined (or fused) to make a single large nucleus, again with the release of large amounts of energy. These two kinds of nuclear explosives were first used as weapons at the end of World War II. The world's first atomic bomb, dropped on Hiroshima, Japan, in 1945, for example, was a fission weapon. The world's first hydrogen bomb, tested at Bikini Atoll in the Pacific Ocean in 1952, was a fusion weapon. Since the end of World War II, a half-dozen nations in the world have continued to develop and build both fission and fusion weapons. Efforts also have been made to find peaceful uses for nuclear explosives, as in mining operations, although these efforts have not been fully successful. I would like the references that were used for this material. fantastic article,what are the freely available explosive compounds? I would like to request the information you guys used and who wrote this article. I would like to use it for my senior project at my high school as a reference. It would be much appreciated. I would like to use this article as a reference for my world history project. Would you be willing to let me do this? thank u for these infomation, its gonna help me in a solid mineral industry. Thats why people could make explosive easily in northen nigeria. Only fission bombs were used at the and of the second world war, your wording makes it seem as if both fission and fusions weapons were used. There were two types of fission bombs, yes, one being a uranium gun bomb type and the other being the much more efficient plutonium implosion, but both used fission reactions. Furthermore, in the east there were indeed military weapons that used black powder, a famous example being the Korean Hwatcha, but they did not move on to firearms, well, that is, unless you consider a hand cannon a firearm. Qn 1, what are the examples of dry and wet explosives? Qn 2. what are the characteristics of fumes? Thanks alot,i was just wondering the types of dynamite sizes & quantities used in mining. Anyone hear of magnetic explosions? a new form of propulsion that will take us into the next century. A tesla invention for time travel.